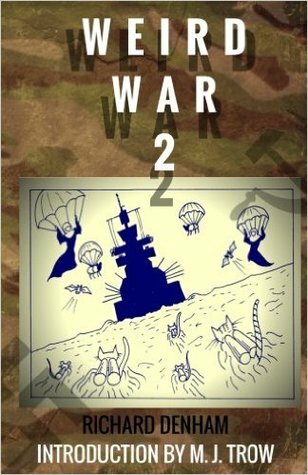 Weird War 2 by Richard Denham is a look at the odd and experimental plans to gain the upper hand in the war. Aside from the curious, there are also some myths that are straightened out. Denham is the co-author of the popular ‘Britannia’ series with M. J. Trow. These books follow a group of soldiers and their descendants through the madness of a chain of events which will eventually lead to the fall of Roman Britain and the descent into the Dark Ages. World War II was a conflict that killed well over 50 million people directly and many millions indirectly through displacement and famine. It is not a war that is associated with humor, but in hindsight, several programs that were taken seriously are now seen as almost comical. From sheep and cat bombs to antitank dogs there were a number of weaponized animal programs that failed miserably. There are also stories of actual products and event of the war from Fanta to Marines (not soldiers) raising the flag on Iwo Jima that are separated from their mythical in their origins. Other stories reflect heroes like the Navajo Code Talkers whose talk could not be decoded by the enemy and the allies own code breaker who was later charged as a homosexual. Denham leads the reader through an improbable collection of stories and facts from World War II. Each item is only a page or two but provides enough information to explain the event or project. Are the stories true? There does seem to be enough supporting evidence although none of the stories are cited as the author claims there is still some disagreement among historians. Several of the stories I have had heard of before in my reading and history classes. Some, however, are very new to me. A fun look at out of the box thinking that accompanied WWII and the desire for a technological edge.